POPULAR ‘Black Five’ No. 45231 The Sherwood Forrester returned to main line metals on November 15 following an intermediate overhaul at LNWR Heritage in Crewe. 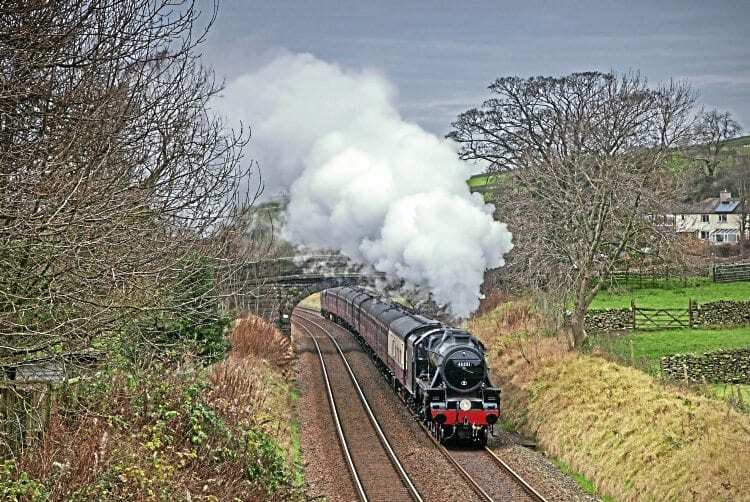 The Stanier 4-6-0, which is part of Jeremy Hosking’s Locomotive Services Ltd fleet, undertook main line loaded test runs around the Hellifield loop on November 15, conducted under the West Coast Railway Company safety case. The ‘Black Five’ had travelled up to Carnforth from Crewe that morning as part of the test, with just its support coach and WCRC Class 37 No. 37516 in tow. It subsequently left Carnforth with seven Mk1s and No. 37516 at 11.48, arriving at Settle Junction 17 minutes early. After waiting for a southbound aggregate train to clear, No. 45231 proceeded via Hellifield, Langho and Blackburn as far as Preston, where it was detached for its run back to Crewe.